Quintus Navale is an Imperial sorcerer and the assistant of the alchemist Nurelion. He lives in The White Phial store. Quintus wears a set of merchant clothes along with a hat and a pair of boots. He wields an iron dagger and carries his key to the store along with a selection of common items and gold. Quintus becomes a potential marriage partner if you have completed Repairing the Phial. Quintus seems to admire his mentor from saying, "My master can be a bit short-tempered, but I've learned so much from him." and "I'll never have Master Nurelion's skill with potions." If you ask him why he works for Nurelion, he'll be surprised: "Are you kidding? I came all the way from Cyrodiil just to work with him. He's... he's not the best teacher. But just watching him, I've learned so much." Quintus is also involved in a quest where Sondas Drenim asks you to deliver his note to Quintus asking for medicine. When Quintus receives it, he will say, "Oh dear. Darkwater Crossing needs medicines for its miners? I'll see about getting this order filled right away. Here, a few Septims for you." If you marry Quintus Navale after completing Repairing the Phial, Nurelion's dead body will show up at the wedding, which will instantly cause the wedding to fail. ? Enter the temple of Mara hours before the wedding starts, then open the console and enter prid 1B115, then resurrect. Wait for the wedding to start and Nurelion will show up alive. When the wedding is over and Nurelion has left, open the console again and enter prid 1B115, then kill, then markfordelete. This will make sure he won't be back at the White Phial. 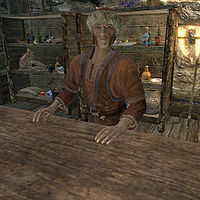 If you never entered the "White Phial" store before (so they haven't talked about the quest yet) and you break in at night Nurelion and Quintus might bug - they won't stop saying "You're not supposed to be here" even if you come back at daytime. "recycleactor" or "resetai" console-commands will not fix this. To fix this, stand outside the shop and use the console codes prid 1B115, then moveto player. This will bring Nurelion outside and from there you can talk with him to continue the quest normally. After marrying Quintus Navale, he will not open shop after moving to the player's home. ? This page was last modified on 3 March 2018, at 18:26.